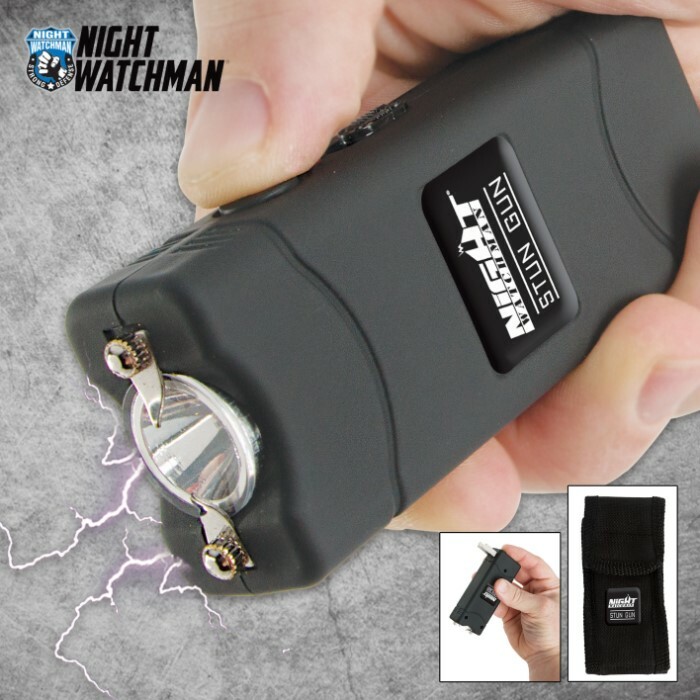 Night Watchman 5 Million-Volt Stun Gun / LED Flashlight | BUDK.com - Knives & Swords At The Lowest Prices! Night Watchman is committed to bringing you reliable personal protection devices you can count on, and this stun gun will do the trick every time. Don't be fooled by this little guy's compact size and plain appearance. It packs a powerful 5 million-volt charge that will bring an assailant to his knees with one pop. 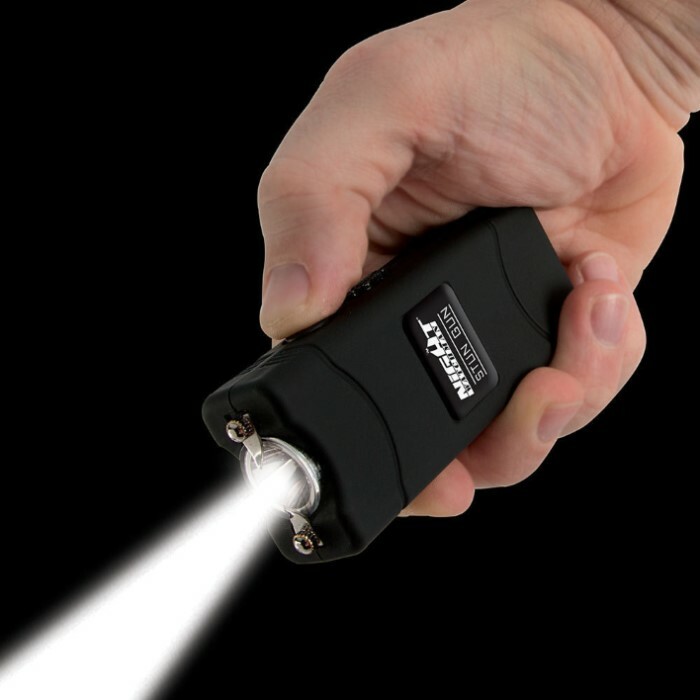 This stun gun also features a built-in LED flashlight to illuminate your path in the dark or in emergency situations. Also, there are no messy cords to fool with on this one; simply plug it into the wall to recharge. A nylon holster case with a belt loop is included so you can wear this stun gun discreetly on your belt. My husband and I were on our way to a follow up doctors appointment because I had a mild stroke in Chicago. We were taking a bus when this man started attacking us for no reason. My husband used this stun gun on our attacker sending him to the back of the bus. My husband announced to everyone that I was sick, but it didn't matter to our attacker and others on the back of the bus sided with our attacker. Our attacker then proceeded to approach us, my husband then cracked the loud stun gun several times stopping our attacker from coming any closer. Our attacker then got off the back of the bus talking trash. If it wasn't for this product things could have gotten ugly. After this incident we ordered a blackjack and a slapper along with pepper spray and more stun guns. Thank you so much Budk! Works well, however, the stitching holding the belt loop to holster falls apart easily. Could be lost very easy if using the loop on your belt. Find another holster you can depend on! I have bought close to 18 of these 5 million volt stun guns. I gave them to all my female family members and to female friends. A great protection device for sure. I have an order in for 4 more right now. They are the “Great Equalizers” and I intend on giving many more away. CH Kadels offer these at a great price and their service is fast and second to none. I think I may have an aquirement issue. I own or owned at least 10 of these in different types. I seem to give them away to people who are friends but appear to be what may seem to some to be a target for those of us (or them) of a predatory nature. Normally my female friends who may have a concern or two. This one is nice with a very bright light and seems powerful. This one sounds impressive and that seems to be the main issue from a psychological point of view. The motive of a possible attacker is severely altered by the sound of something that might turn one into a french fry. Ok, sorry about the elaboration but it's cheap, light, bright and it's fun to explain to girls.